Thin markets & the closure of trading books for the end of the year are likely to lead some volatile and unpredictable trading patterns over the next few weeks, all of which is not helped by the current uncertainty surrounding the euro. Whilst fears have been allayed to some extent by the request from the Irish authorities for assistance, the Irish problem is far from over and the question now is whether contagion will spread with Portugal now next in line for a request for life support. Greece, of course, still remains a basket case and these three between them could drag Spain into the current mess which could signal a major problem for the euro. From a technical perspective on the weekly euro vs dollar chart the euro to dollar ended with a hammer candle with the low of the week at USD1.3447 finding strong support from the 14 week moving average with the pair closing marginally lower at USD1.3669. As such, and following the prior week’s sharp sell off, we can expect to see the euro to dollar climb higher this week and the first target is the 9 week moving average which currently sits above at USD1.3855. 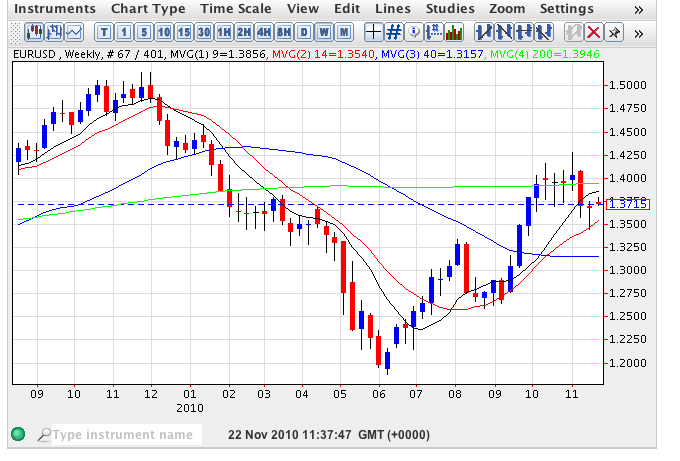 A move beyond here will open the way to a test of the 200 week moving average at USD1.3946 and if this is breached then we may see the euro to dollar reclaim the USD1.40 region once again. However, with the ongoing problems in the eurozone, the lack of fundamental news & thin markets this could be a struggle so only attempt small long positions on an intra day positions with very tight stops.